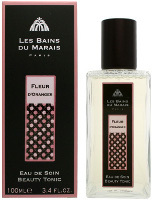 Fleur d'Oranger: This is a soft orange blossom fragrance with musk and honey. It is subtle, but it gets deeper and more honeyed as it warms on the skin. It is lovely on its own, and I tried several big sprays with just a tiny drop of Diptyque Tam Dao, and that was lovely too. My favorite of the four. Rose Confiture: This is a straightforward rose water fragrance, simple, but very nicely done. It is a bit stronger than the Fleur d'Oranger, and lasts longer, but it stays delicate and very fresh. As advertised, it smells just like real rose petals, and it does not turn sour on the skin as some roses are wont to do. Jasmin: The jasmine fragrance has moroccan jasmine and a touch of musk. The musk is restrained, but perhaps more noticeable than in the Fleur d'Oranger, and the jasmine is light and airy but true to the flower. It makes a perfect backdrop for L'Artisan Thé pour Un Été. Musc Blanc: This is a very clean musk with a hint of rose and cedar. Fans of clean fragrances should give this a try, as it manages to smell just like freshly washed laundry without being overly soapy or smelling like baby wipes. Personally I don't usually care for clean scents, so this was my least favorite of the four, but I think it has elicited the most admiration on the fragrance board at MakeupAlley. Strictly speaking, these are bath & body products more than true perfumes, but the fragrances are beautifully done. The Eaux de Soin don't contain alcohol, so they stay very close to the skin and they are not terribly long lasting. Any of them would be perfect for a hot summer day or any other occasion when you don't want to wear something heavy. I am very impressed with the Eau de Soin orchid oil formula. It soaks in completely, and leaves the skin soft but not in the least greasy. You can of course apply it on pulse points, but I just sprayed all over my arms. I also tried a light spritz of the Rose Confiture in my hair, and it lasted for hours. I did not get to try the Huile de Soin, which is based on jojoba, olive and argan oils. It can be used as a body oil, or in the bath, where it will turn the water milky-white. According to Blue, the Huile de Soin has a lighter fragrance concentration than the Eau de Soin, but since it is an oil, it will last longer, and you can layer the two to increase the staying power. For buying information, see the listing for Les Bains du Marais under Perfume Houses. I love it when you give layering suggestions … the fleur d'oranger with tam dao sounds wonderful. What a coincidence…I was just over on your blog! You have to really go light on the Tam Dao, or it will overwhelm the BdM completely. I want to try this with some other wood scents too. how do you compare this version to other FdO versions? and what about the lasting power? As I said, this is really more like a body product…it isn't what I'd call a “full fledged” perfume, and I wouldn't really compare it to one. I use it as a first layer, or on days when a scented lotion is all I want. aahhhh, thanks so much, R!